You may already know how important Omega-3 fatty acid supplementation is for dogs and cats. I consider it to be the #1 most important supplement you can give your pet. The anti-inflammatory effects of Omega-3s EPA (eicosapentaenoic acid) and DHA (docosahexaenoic acid) have been thoroughly researched. Omega-3 supplementation has proven to be beneficial for dogs and cats for a wide variety of conditions, including chronic kidney disease(1), arthritis(2), allergies(3), and skin and coat problems(4). The vast majority of plant-based oils are in the form of Omega-6 fatty acids, which are already over-supplied in our pets’ diets. Flaxseeds and a few other seeds and nuts also contain the Omega-3 alpha-linolenic acid (ALA). ALA has beneficial effects of its own, particularly on skin and coat health. However, after weaning, dogs and cats (and humans) cannot convert more than 1-2% of it into EPA and none to DHA (the essential fatty acids that are so important to health)(5). Only marine oils contain these particular Omega-3s in a completely bioavailable form. Many people are confused about this product, but there are no Omega-3s in coconut oil. Read more about coconut oil here. Most species of algae naturally produce DHA, but very little if any EPA. In order to obtain a better balance, some species have been genetically selected to produce more EPA. (6) However, algal oils may also contain Omega-6 fatty acids, which are undesirable because they tend to promote inflammation. While algal oil is a valid choice for vegan individuals, dogs and cats are not (and should not be vegans), and should get their Omega-3s from an animal source. Some squid oils are “supplemented” with other Omega-3s, but this may consist primarily of vegetable oils containing the Omega-3 alpha-linolenic acid. While DHA is important during fetal development and for maintenance, EPA is the anti-inflammatory Omega-3 that is most important for our pets, especially as they age. Squid are closely related to octopi and are just as intelligent. While they were previously caught by single line; now large nets are deployed as they become a more popular source of human food. Squid oil is typically made from the waste products of squid processing. Most salmon oil (and all salmon products from the Atlantic Ocean, Scotland, and Norway) comes primarily from farm-raised salmon. These factory-farmed fish are grown in polluted, overcrowded pens(8); they are heavily vaccinated(9), and fed dyes, antifungals, parasiticides, and antibiotics(10); and they contain up to 10 times more mercury, dioxins, PCBs, and other toxins than wild fish(11,12). Farmed salmon also pose a serious threat to wild species in both Atlantic and Pacific oceans from interbreeding of escaped fish(13), parasites (14), and disease(15). Additionally, about 1/3 of labeled “Alaska,” “wild,” and “wild-caught” salmon are not truly wild, but bred and raised in hatcheries; their release into the ocean is threatening both wild salmon, and other fish(16). Oil from farmed fish also contain less Omega-3s and far more Omega-6s than wild fish(17). Cod liver oil is commonly supplemented with Vitamins A and D at levels that could easily become toxic in cats and dogs(18). Moreover, a loophole in the law allows non-cod species to be labeled as cod. Mass-produced, low-priced fish oils usually contain filler oils (such as sunflower, safflower, canola, and olive oil), which add undesirable Omega-6s, and are typically processed with harsh chemicals. There are also oils made from other fish, such as menhaden (a threatened keystone species, and the source of most unspecified “fish oil”). Sardine, herring, and anchovy oils are, so far, more sustainable and cleaner than most other fish oils. While it’s best to use a product made specifically for pets in order to avoid the additives found in human products, many pet fish oils are quite low in potency, and may not be sufficient for your pet’s needs. It may be relevant to some that fish die by suffocation when caught, which is neither instant nor painless. If you do want to use a fish-based oil, I recommend Nordic Naturals, whose quality I trust. New Zealand greenlip mussels (Perna canaliculus, GLM) are grown under a Sustainable Farming Program that ensures the long term viability of the greenlip mussel industry, with minimum impact on the environment. GLM are bi-valve mollusks with proven value for canine arthritis. (21) GLM provide a rich source of 33 fatty acids, of which 5 are Omega 3s (including essential Omega 3s EPA, DHA, and alpha linolenic acid). One of GLM’s unique array of Omega 3s is ETA (eicosatetraenoic acid). ETA–which is not found in any other food to any measurable degree–has extremely powerful ant-inflammatory properties and is beneficial for the heart. (22) GLM oil has less saturated fat, and more mono- and polyunsaturated fats, than fish oil or cod liver oil. In order to ensure freshness, the mussels grown for MOXXOR are chilled and processed in a facility built on the shores of the sound where they are grown. In addition, the other two components of MOXXOR, Sauvignon Blanc grape seed husk extract and kiwifruit seed oil provide additional antioxidant power, including all 8 members of the Vitamin E family. These ingredients also safeguard MOXXOR’s freshness and stability by scavenging the oxygen free radicals that cause rancidity. MOXXOR comes in a very small capsule, making it easy to give even to small pets. 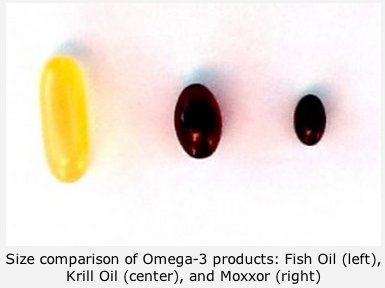 This photo shows the difference between a gigantic fish oil capsule (on the left), a krill oil capsule (center), and a capsule of MOXXOR (on the right). Additionally, MOXXOR’s mild taste is generally well accepted, even by the fussiest of cats and dogs. In fact, some dogs will even eat it as a treat. For all these reasons, I believe that MOXXOR is the ideal Omega-3 fatty acid supplement for pets (and people). (1) Bowden RG, Wilson RL, Deike E, et al. Fish oil supplementation lowers C-reactive protein levels independent of triglyceride reduction in patients with end-stage renal disease. Nutrition in Clinical Practice. 2009 Aug-Sep;24(4):501-12. (2) Roush JK, Dodd CE, Fritsch DA, et al. Multicenter veterinary practice assessment of the effects ofomega-3 fatty acids on osteoarthritis in dogs. Journal of the American Veterinary Medical Association. 2010 Jan 1;236(1):59-66. (3) Abba C, Mussa PP, Vercelli A, Raviri G. Essential fatty acids supplementation in different-stage atopic dogs fed on a controlled diet. Journal of Animal Physiology and Animal Nutrition (Berl). 2005 Apr-Jun;89(3-6):203-7. (4) Bauer JE. Responses of dogs to dietary omega-3 fatty acids. Journal of the American Veterinary Medical Association. 2007 Dec 1;231(11):1657-1661. (5) Boelen P, van Dijk R, Sinninghe Damsté JS, Rijpstra WIC, Buma AG. On the potential application of polar and temperate marine microalgae for EPA and DHA production. AMB Express. 2013;3:26. .
(6) Dunbar BL, Bigley KE, Bauer JE. Early and sustained enrichment of serum n-3 long chain polyunsaturated fatty acids in dogs fed a flaxseed supplemented diet. Lipids. 2010 Jan;45(1):1-10. (7) Meynier L, Morel PCH, MacKenzie DDS, et al. Proximate composition, energy content, and fatty acid composition of marine species from Campbell Plateau, New Zealand. New Zealand Journal of Marine and Freshwater Research. 2008;(42):425-437. (8) Cole DW, Cole R, Gaydos SJ, et al. Aquaculture: Environmental, toxicological, and health issues. International Journal of Hygiene and Environmental Health. 2009 Jul;212(4):369-77. (9) Gudding R, Lillehaug A, Evensen Ø. Recent developments in fish vaccinology. Veterinary Immunology and Immunopathology. 1999 Dec;72(1-2):203-212. (10) Done HY, Halden RU. Reconnaissance of 47 antibiotics and associated microbial risks in seafood sold in the United States. Journal of Hazardous Materials. 2015 Jan; 282:10-17. (11) Berntssen MH, Maage A, Julshamn K, et al. Carry-over of dietary organochlorine pesticides, PCDD/Fs, PCBs, and brominated flame retardants to Atlantic salmon (Salmo salar L.) fillets. Chemosphere. 2011 Mar;83(2):95-103. (12) Hites RA. Global Assessment of Organic Contaminants in Farmed Salmon. Science. 2004;303(5655 ):226–229. (13) Roberge C, Normandeau E, Einum S, et al. Genetic consequences of interbreeding between farmed and wild Atlantic salmon: insights from the transcriptome. Molecular Ecology. 2008 Jan;17(1):314-24. (14) Stokstad E. Parasites from fish farms driving wild fish to extinction. Science. 2007 Dec 14;318(5857):1711. (15) Krkošek, M., M.A. Lewis, A. Morton, L.N. Frazer, J.P. Volpe. 2006. Epizootics of wild fish induced by farm fish. Proceedings of the National Academies of Science. 103:15506-15510. (18) National Research Council. Nutrient Requirements of Dogs and Cats . Washington, DC: The National Academies Press, 2006, 194-205. (19) Schiermeier Q. Ecologists fear Antarctic krill crisis: fishing industry threatens to destabilize stocks. Nature. 2010;467:15. (20) Bierer TL, Bui LM. Improvement of Arthritic Signs in Dogs Fed Green-Lipped Mussel (Perna canaliculus). Journal of Nutrition. June 1, 2002 vol. 132 no. 6 1634S-1636S. (21) Øie E, Ueland T, Dahl CP, et al. Fatty acid composition in chronic heart failure: low circulating levels of eicosatetraenoic acid and high levels of vaccenic acid are associated with disease severity and mortality. Journal of Internal Medicine. 2011;Sep;270(3):263-72.